KIEV, Ukraine -- In the European Union’s second Eastern Partnership Integration Index (EPII) report, trends evident already last year are continuing. Renat Kuzmin, Ukrainian deputy Prosecutor-General. This report confirms the EU’s assessment of the first year of the new ENP. “The area of deep and sustainable democracy experienced a further deterioration in 2011,” and “several leading opposition figures, including former Prime Minister Tymoshenko, were subjected to selective justice, characterized by un-transparent judicial processes,” the EPII proclaims. According to the EPII, Moldova is the “most willing reformer,” with Georgia ranked poor on democracy but good in other reforms. Ukraine’s democratic and business climate rankings are falling even in comparison with Armenia. Moldova, Georgia and Armenia are ranked better than Ukraine in market economic reforms, fighting corruption and the independence of the judiciary. Ukraine is the only Eastern Partnership country where the business climate has declined. Armenia’s dialogue with the EU is more advanced than Ukraine’s, and in Kiev there is a lack of political will “to bring the country’s norms and standards closer to those of the EU,” according to Brussels. After being elected to power, Viktor Yanukovych closed the presidential and government bodies, which were responsible for European integration, and there is no longer a single institution tasked with coordinating this process. This contrasts sharply with the situation in Chisinau and Tbilisi. Moldova’s Minister of Foreign Affairs and European Integration (who is also Deputy Prime Minister) and Georgia’s State Minister for European and Euro-Atlantic Integration are senior positions in their respective governments that reflect the Moldovan and Georgian leadership’s prioritization of European integration. Based on trends in 2011-2012 and undemocratic elections forecast for this upcoming October, the EPII will likely rank Armenia ahead of Ukraine by 2013. Sources in the EU’s European External Action Service have said, “We have huge doubts about whether the [October parliamentary] elections can be declared free and fair if Yulia Tymoshenko and other opposition leaders will not be able to take part in them. In this case, it will be very difficult to recognize the elections as having taken place in accordance with European standards”. Deputy Prosecutor-General Renat Kuzmin has categorically stated that imprisoned opposition leaders Tymoshenko and former Minister of Internal Affairs Yuriy Lutsenko cannot participate in this year’s elections. Kuzmin said, “They are condemned by the Ukrainian courts and their verdicts have entered into force. Under current legislation, individuals cannot participate in elections with outstanding and expunged convictions”. Only three percent of Ukrainians believe this year’s elections will be democratic, according to a June Razumkov Center poll. Ukraine began its negotiations for an Association Agreement (AA) with the EU in 2007 and for a Deep Comprehensive Free Trade Agreement (DCFTA) a year later. Negotiations were expected to be finalized in 2012. Current Eastern Partnership favorites, Moldova (which has successfully closed 23 out of 25 chapters in its AA negotiations) and Georgia, launched negotiations in 2010, and they are expected to be completed by next year. With Ukraine’s AA “suspended,” according to German Foreign Minister Guido Westerwelle, Moldova and Georgia will be integrated closer into Europe before Ukraine. Disillusionment with Ukraine is deepening in both Brussels and Washington. EU Ambassador to Ukraine Jose M. P. Teixeira was asked if Ukraine had lived up to the EU’s expectations. He replied, “Of course not! Four years ago we expected completion not only of negotiations by 2012 but, more importantly, implementation of the Association Agreement, and we expected progress in reforms”. Former NATO Secretary General and EU Foreign Policy Chief Javier Solana said the same: “For myself, Ukraine is one of the biggest frustrations of my life” blaming the “lower than average level” and “underdeveloped and weak” Ukrainian political class. Head of the Socialist political group in the European Parliament Hannes Swoboda revealed that his party had earlier frozen and was now annulling its 2010 cooperation agreement with the Party of Regions because of undemocratic policies by the Yanukovych administration. Former European Parliament President Jerzy Buzek and former head of Ukraine’s presidential administration Viktor Medvedchuk both see Ukraine as already internationally isolated. Medvedchuk pointed to the unique situation where Washington, Brussels and Moscow all have poor relations with Kiev. EU leaders, such as Teixeira and Polish President Bronislaw M. Komorowski, are saying the AA can only be signed if Ukraine’s elections are democratic. But this will be impossible without the participation of opposition leaders. Ukraine’s isolation will therefore grow after the elections and, according to former US Ambassador to Ukraine Steven Pifer, “enter a state of “cold war”." Ukrainian analyst Olga Shumylo-Tapiola explains that “the Ukrainian leadership does not believe the EU is serious about its values”. Kuzmin condemned Western criticism of the selective use of justice in Ukraine as “double standards,” a traditional Soviet and current Russian response. Kuzmin ridiculed “all of these ‘black lists’ and of all of this nonsense, which is discussed in the media,” and, in typically Soviet conspiratorial terms, wondered whether the goal was the removal of Yanukovych from power. 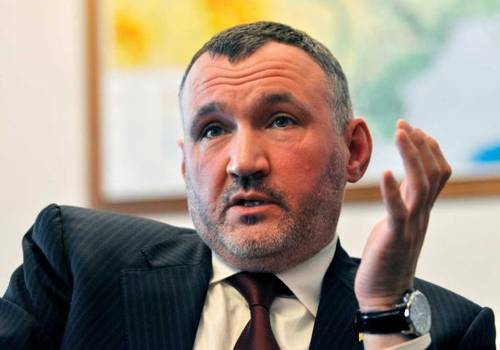 European MEP Pavlo Koval believes the EU will introduce sanctions after the elections and these could take the form of a visa ban, blocking of bank accounts, and freezing of official visits and meetings. Ukrainian deputy Taras Chornovil, whose former wife and child live in Germany, has revealed that visas have already become more difficult to receive even for official people like himself. Nevertheless, for Europe to introduce sanctions against Ukraine, the EU would have to close many current avenues for incoming Ukrainian capital. The EU has never introduced tough regulations on capital flows and money laundering to the same extent as the United States. Since 2010, when Yanukovych was elected, 400 billion hryvni ($53.4 billion) has been sent offshore by Ukrainian oligarchs and banks to EU countries and British Commonwealth countries, which act as tax havens. This is more than the 2012 Ukrainian state budget of 367 billion hryvni ($45.4 billion). In the first two months of this year, another $87 billion was transferred. EU member Cyprus, which accounts for a third of FDI into Ukraine, received the bulk of these capital flows – $51.5 billion. Is former Ambassador Pifer therefore correct when he states the US and EU have the same concern for democratic values in Ukraine? Or are business and stability more important for the EU? The EPII results point to how the Arab Spring embarrassed the EU because Brussels “favored stability over democracy”. Yanukovych, meanwhile, does not see problems and continues to recant his devotion to European values.